The optimal input signal design is a procedure of generating an informative excitation signal to extract the model parameters with maximum accuracy during the estimation process. 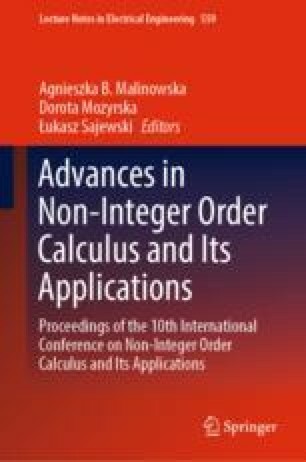 Non-integer order calculus is a very useful tool, which is often utilized for modeling and control purposes. In the paper, we present a novel optimal input formulation and a numerical scheme for fractional order LTI system identification. The Oustaloup recursive approximation (ORA) method is used to determine the fractional order differentiation in an integer order state-space form. Then, the presented methodology is adopted to obtain an optimal input signal for fractional order system identification from the order interval \(0.5 \le \alpha \le 2.0\). The fundamental step in the presented method was to reformulate the problem into a similar fractional optimal input design problem described by Lagrange formula with the set of constraints. The methodology presented in the paper was verified using a numerical example, and the computational results were discussed. The present study was supported by a grant S/WI/3/18 from the Bialystok University of Technology and funded from the resources for research by the Ministry of Science and Higher Education.